To determine the amount of electricity your outdoor power source can handle, go to the main circuit breaker panel, find the switch for the outdoor outlet, and look for a number printed on it (15 to 20 amps is average for outdoor outlets). “Only use about 70 percent of the circuit” (which would be 14 amps of a 20-amp circuit), says Chris Fitts, a professional lighting designer and installer in St. Augustine, Florida. To figure out how many strands you can hang, multiply the watts and then divide by 120 (100 bulbs at 7 watts each would be 700 watts; divided by 120, that equals 5.8 amps). The wattage of each strand will be listed on the box and will differ for LEDs and incandescents. Make sure the lights you buy are outdoor-safe. Walk to the front of the house and snap a photo. “You’ll see your property like a passerby and identify which features pop and are worth decorating and which ones won’t be on view and therefore can be skipped,” says Fitts. Seeing the big picture will also help you identify a focal point to decorate around. For most homes, that’s the front door, since people’s eyes naturally gravitate toward it. Fitts likes to print a few copies and sketch different lighting blueprints to use as a guide for hanging. 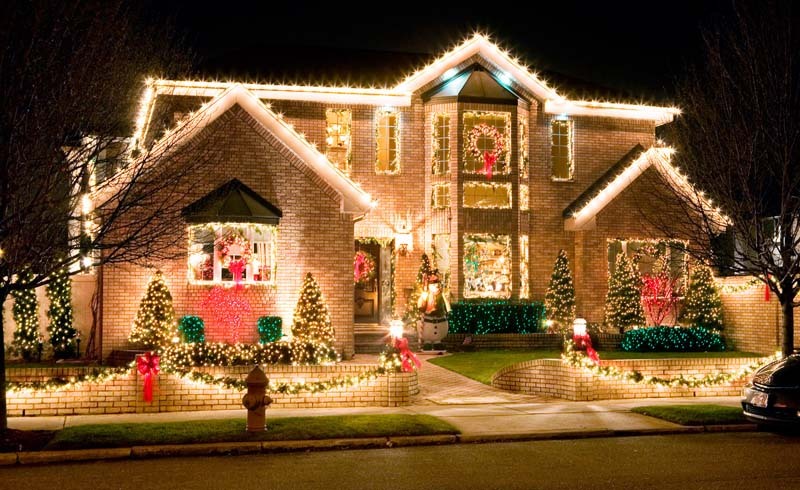 The game plan can be as simple as outlining the front door in lights and wrapping a few strands around columns or shrubs. Grab a tape measure, outdoor extension cords, electrical tape, and a dependable ladder, says Scott Parrish, a professional light installer with Illuminight Holiday Lighting in Chicago. Pick up an outdoor timer, which can help keep electricity bills low, and ditch the hammer and nails, which can damage surfaces over time. “Zip ties will secure lights to porches and columns, and plastic clips are great for hanging strands,” says Fitts. 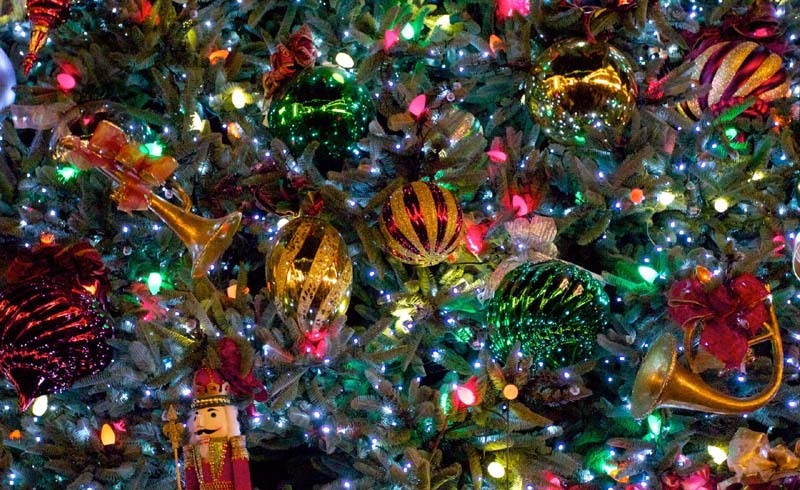 Before putting up strands, plug them in—even new ones—to check for faulty bulbs. Next, do a shake test: If bulbs flicker or turn off, don’t hang them, because they will likely go out. Using the tape measure, go around the door and window frames. “Estimate the roof by measuring the base of your house and adding a foot or two just to be safe,” says Parrish. (Note: Lighting a roof is best left to professionals unless you’re extremely comfortable and experienced on a roof.) If you’re wrapping any poles or banisters with lights, use a soft tape measure—one you might find in a sewing kit—and wrap it around the surface for a more accurate measurement, says Fitts. Size up the distance to the power source too, which will help determine the length of any extension cords you might need. Mark measurements on your design plan. Set aside at least half a day to put up lights, says Parrish. (Never hang lights on rainy or snowy days.) Tackle one area at a time, such as the porch or walkway shrubs, stepping back after you finish to make adjustments. Don’t connect too many strands together or you’ll overpower the string’s fuse, causing the lights to power down. “For LEDs, you can put around 20 strands together, but incandescent ones should be limited to four 100-bulb strands,” says Parrish. Always double check the box, which should give limits. Wrap electrical tape where the strands connect to seal the area from moisture and to prevent the lights from separating in wind and snow.